"Surely you have heard of them. They were famous for their work in the Echo Factory...famous, and also despised. Their enemies, perhaps the renegade group your sister has joined, killed them." The dark glee in Victoria's expression as she revealed this caused Ariella's anger to burn brighter. "You expect me to believe that the two Autofficers who died in the Echo Factory attack were my parents?" Ariella shouted, then broke out in a sort of crazed laughter. It echoed strangely through the still air, and Victoria looked a bit unsettled. In a wary voice, she said, "It is true, Newheart...or rather, Denight. The records are in the Junior Academy and the Academy Automicus." Ariella's breaths came rapidly, and her head felt light. "Why did no one ever tell us, then?" "Because the enemies of your parents may have come after you and your sister next. You were given false last names and split up in the hopes that those who hunted you would be thrown off the scent. And the plan succeeded. Did you really expect that two children of supposedly unknown birth would have been given positions in the Fogworks and the Academy Automicus? No, that's not the way the Empire works. Does this not explain why such special interest has been shown in both of you?" Victoria began to scowl. "You should be grateful, Denight, but instead your heart is turned against our benevolent Emperor." "My name is not Denight!" Ariella shouted. "I am Ariella Newheart!" "You are a Denight whether you like it or not. Now swear loyalty to the Emperor or suffer the consequences." "No! I will not follow in the steps of my so-called parents, no matter what consequences are brought upon me! I hate the fog, I hate the automatons, and I hate the Empire!" With Ariella's final declaration, Victoria's expression turned to one of rage, and she pressed a button on her gauntlet. The Automayeti came to life, its heavy footsteps shaking the ground. With a prayer, Ariella dropped the bomb into the flame of green fire and a moment later smoke poured into the air. Ariella's parents had been loyal to Lucky. They had overseen the manufacturing of automatons in the Giant Seed Forest. They had died in the renegade attack on the Echo Factory. Ariella and Arona had been sent to the Junior Academy under assumed names to be protected from those who had killed their parents. Questions now came in floods, each one without an answer. Was her name really Ariella? Had Ariella been wrong to turn her back on Lucky? Was her heart really the heart of a Denight? A heart of darkness? A heart consumed by fog? A heart loyal to the Empire? Why had thoughts of rebellion crossed Ariella's mind, if her parents were Autofficers? The sound of coughing echoed behind her, but Ariella soon disappeared north, glad that dark clouds were now rolling over like a blanket. The unnatural stillness in the air was a hint that snow would soon cover her tracks. As snowflakes began to fall gently to the ground, Ariella heard a loud sound and glanced upward. One of Lucky's airships was flying toward the east. Had Victoria been given command of one of those, too? Ariella's heart sank, then leaped as a realization hit her. This airship was different from Lucky's. A red banner flew from it, one with a golden "R" insignia on it. It was the Resistance! Ariella wished she could see where the airship was going, but to follow would lead her directly into Victoria and the Automayeti. Besides, Victoria had surely seen the airship, too, and would go investigate. Directly ahead of Ariella was a fog gate blocking the entrance to a narrow canyon. With her gas mask pressed tightly against her face, Ariella hurried through the cloud of fog rising upward from the vent. Should she hide here in this canyon? An abandoned research station was built within it, and might help shelter her from the storm as it grew more and more ferocious. 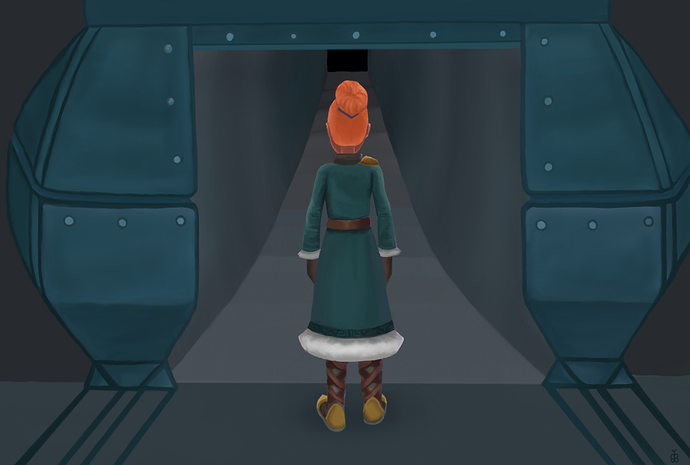 Shivering, Ariella huddled against the wall of the remaining half-dome of the research station. The snow now came down thickly, accumulating in piles at her feet. Ariella peered out into the storm and noticed that something was sticking out of a nearby snowdrift. She went to investigate, wading through the drift with some difficulty. After brushing away the loose snow from the around the object, Ariella discovered that it was a trapdoor. Beneath the trapdoor was a ladder which descended into darkness. Arona Copperburst walked down the streets of No Man's Landing, watching for automatons. Her new Tesla hammer sparkled with electricity. She was on a mission for the Resistance. Several weeks ago, she had arrived in No Man's Landing with Molly Cartdust and the Inspector. They'd come to the old print shop, called the Beacon, and left a note on the desk by the wardrobe, just like May had told them to. Then they'd wandered around, dodged the patrolling automatons, and had finally come to a place called Urchins' Grotto. However, there didn't seem to be any urchins anywhere in this grotto. Arona thought they must have been scared away by the Inspector, or were hiding in their small hovels. While the Inspector guarded them, she and Molly had hunkered down in an abandoned hovel for the night. The next morning, two members of the Resistance had found them and taken them back to the Beacon. Sheka and Annkarette were their names. They were nice girls, but they did seem very suspicious of the Inspector. It had taken Arona a long time to convince them that the Inspector was a friend, and no longer loyal to Lucky. Still, they'd insisted upon making sure the Inspector's communication antenna was deactivated, which it was. Arona and Molly had been introduced to many other Resistance recruits, and even been shown a secret passageway that led to a basement: Resistance Headquarters. Molly had found her brother, the one who she hadn't seen since she was sent to the Junior Academy. His name was Jacoby Elderfun, and he had been busy the past few weeks teaching Arona and Molly how to fight automatons. Arona was on her first fighting mission. Previous quests had sent her on errands, such as painting signs, locating missing crates, putting up posters, smashing propaganda machines, and so on. This one was different. She had to clear the Town Square of automatons. Her Tesla hammer flashed again, and she smiled. This was going to be fun. Behind her, the Inspector marched along. Even after these many weeks, no one trusted the automaton, least of all the Resistance leaders like Mr. Alexander, Mr. Ironheart, and Miss Brassheart. Arona figured the Inspector could be used to infiltrate the ranks of the automatons here in No Man's Landing--if everyone would give it a chance. Eventually, Arona hoped to prove that the automaton was an ally. She'd made a few upgrades to it, including new armor, weapons, and optics. The only thing that she hadn't done was change its fog boiler to an Aether boiler. The Inspector wouldn't be able to function with an Aether boiler; it was only programmed to work with fog. Arona entered the Town Square and faced a Pacifier Officer and the Troubleshooters standing on either side of it. The Inspector watched her, waiting for a command. "Well, smash them or something!" Arona told it, jumping forward to deal a heavy blow to one of the Troubleshooters. "Try out your new rifle!" Jacoby had told Arona that water increased the electric attack, so she would try that next, if the Inspector would make up its mind about which auto to attack. The Inspector's new water rifle, integrated where its pencil and notebook had once been, sprayed an opposing automaton with a burst of water. Arona ducked an attack from the drenched Pacifier and then hit it with her hammer, completely smashing its difference engine. Now she had to take care of the Troubleshooters. "Need any help?" a voice called from behind her. Jacoby approached Arona from the direction of the Business District with Skybie Jumpdust, another member of the Resistance, just behind him. "With these useless heaps of metal?" Arona laughed. She glanced at the Inspector and frowned. "No offense." It just glared at her with unblinking green eyes. "I guess I could use some help. I'm working on my first fighting quest," Arona conceded. The two kids quickly entered the fight, brandishing their weapons. "It's so strange to see automatons fighting each other!" Skybie exclaimed, speaking of the Inspector fighting the Imperial autos. She used her umbrella cane to deactivate one of the Troubleshooters. "Have your automaton wait to do another water attack," Jacoby said to Arona. "My starter pistols are fire weapons, and water makes them do less damage." Just as Arona was about to tell the Inspector this, the automaton launched another water attack on the lone Troubleshooter. "Sorry, Mr. E!" Arona apologized, deactivating the automaton with her hammer. "The Inspector only takes orders from me. That can be a good and a bad thing." Jacoby squinted at her. "Are you sure it's loyal to you?" Arona turned on him indignantly. "Of course it is!" "A name like 'the Inspector' isn't really good for a Resistance automaton," Skybie pointed out, going to salvage a few cogs from the Troubleshooter she had taken down. "It sounds like something the Empire would use." "That's just what we kids at the Junior Academy called it. I suppose I could make up a new name," Arona said in a thoughtful voice. The three of them went to take down the other automaton patrol, and once that was done, Skybie and Jacoby filled the Great Engine with Aether from their Aethermeters. Arona was still looking for a crafting recipe for one. The others told her that when she'd been with the Resistance for a while, she would eventually get the plans from the Scarlet Man himself. Arona had never seen him, but he always seemed to be around. Even now, she saw a scarlet nail pinned on the tower, one of his. "I'm going to go turn in this quest, now that I've finished it. Thanks for the help!" Arona said, waving at her two friends. She turned to go, the Inspector still following her. Maybe Arona should make up a new name for the automaton. Yes, she would do that. Ariella climbed down the ladder and closed the trapdoor against the howling gale. She stood in complete darkness and fumbled to light her clockwork furnace by cranking the key on the side. The gears ground against each other for a moment, then the furnace glowed to life. The faint light revealed a cylindrical chamber with a crafting table, a few crates, and a stack of barrels. It was so cold that the piles of snow along the walls weren't melting. She looked down at the furnace again. It had a limited amount of coal, and wouldn't last long. The dark lamp attached to the side of the crafting anvil caught her eye. If she could get it to work, she might not need the furnace for illumination any longer. Holding her light source in one hand, Ariella approached the anvil and brushed at the coat of frost which had accumulated on its metal surface. Long icicles also hung from the sides, glittering in the amber-colored firelight. She set the furnace down on the crafting anvil's top and examined the lamp. The switch on the side did nothing. The reason, she guessed, was because the hinges and wires of the lamp were frozen under more ice. At least the mechanisms appeared to be intact. If she could thaw them, the light might start working again. She cupped her gloved hands around the metal to warm it. The clockwork furnace also helped, casting its meager warmth and brightness onto the frozen wires. As the final wire came free of the ice, Ariella tried the switch again. A low humming sound filled her ears. Gradually, the lamp began to flicker and shine its clear, yellow light. It filled her with a warm sense of satisfaction. She tried to grin, then closed her mouth for fear that her teeth would freeze. After putting out the glowing embers of the furnace, Ariella sat down on a crate and pulled her fur parka tighter around her shoulders. The cold air made her eyes and lungs sting, and her feet were growing numb. If worst came to worst, she could always use the wooden barrels as fuel for her furnace, right? She eyed the three large containers, wondering how long they would burn for. A faint sound drew her attention to the opposite side of the room where there was a dark hallway that she hadn't noticed before. The sound, something like a low, metallic screech, repeated. Ariella held her breath, a chill of fear numbing her more than the cold ever could. A rhythmic thudding joined the occasional screech, and a single realization shattered through her thoughts. Something else was down here. Ariella stood, letting out a shaky breath. She approached gaping mouth of the hallway, watching for movement and listening. But there was nothing to see or hear. Whatever it was must have moved further away. Or...it was just being very, very quiet. The nearby sound of the metal floor creaking startled her. Was something behind her? To turn around and look would be to put her back to the dark hallway, a prospect that she found rather unnerving. After a moment, she glanced quickly over her shoulder...and saw nothing but the stack of barrels. Was someone in one of the barrels? Ariella took a deep breath and tried to calm her racing heart. She had to think logically. There had been no one in the room upon her first inspection of it, and no one could have slipped past her in the time that she'd spent fixing the lamp. And besides, if someone was in a barrel, they would be very cold by now. The metallic screech echoed again from the hallway, and Ariella snapped her head around to look. There was still nothing. She took a slow step toward the wall behind the crafting anvil, her back straight and muscles tense. From there, she would be able to see both the hallway and the stack of barrels. Beneath her foot, the metal floor squeaked, and she realized something. The previous creak must have been from her own footstep. Still, she would keep an eye on the barrels. With a shiver, she sat on the crate by the anvil and huddled into her parka, her gaze darting back and forth between the barrels and the hallway. If only the storm would calm...and if only the day would dawn. Arona took a few pieces of fog-rock from one of the carts that clattered along the rails into Little Stone Salvage. She tossed them into the Inspector's fog boiler and sat down by the docks to brainstorm. After a little while, she decided upon the acronym CALIVAR for the Inspector's new name. Elated by her success, Arona skipped along to the Beacon to turn in the completed combat quest. She left the Inspector outside the building, then slipped past the bookshelf and down the shadowy stairs. "Hi, Miss Brassheart," Arona said as she spotted the older girl standing in the center of the basement. Hanna Brassheart's bright copper hair reminded Arona of Ariella. Her smile faltered when she remembered that she hadn't gotten a letter from her sister in a long time. The last one had come several weeks ago, and in it Ariella had warned Arona to be careful with the Inspector. "Hey, Arona! What brings you here?" Hanna asked cheerfully, looking up from the map table. "I'm turning in this mission. Jacoby and Skybie helped me finish it. So did the Inspector." Hanna suppressed a wince as she heard the name. Didn't Arona know that fog-powered automatons could not have their allegiances turned by a mere animus servo? Even if they could, the Inspector still had a fog boiler and therefore was still a danger to the Resistance. She took the quest paper and handed Arona the reward of 3 pipes in return. "I decided to give the Inspector a new name," Arona said after a moment. Hanna raised her eyebrows. "An automaton is still an automaton. Calling it by another name won't change it any more than a servo will." "I know a new name won't change it, but I wanted the Inspector to be called something more friendly. CALIVAR." "Isn't a caliver a type of gun? That's not really friendly," the other responded, frowning. "CALIVAR, with an 'a.' Yeah, I couldn't figure out the right word for an 'e' in the acronym." At this, Miss Brassheart's eyebrows raised farther. "You made up an acronym?" "Yes, C-A-L-I-V-A-R. Combat Automaton of Limited Intelligence and Versatile Assimilation Robotics," Arona replied. "That's actually a good acronym," Hanna admitted. Arona smiled and looked down. "Calivar's still waiting outside. I think he's getting impatient." "Well, Calivar sounds like a boy name." Hanna sighed and rubbed her forehead. "Arona." She stepped around the table to stand in front of the younger girl. "This automaton is a danger to the Resistance. We allowed you to keep it and continue making modifications to it, but now I'm sorry we did. You keep insisting that it's loyal to you and the Resistance...but is it? It has a fog boiler. Unless it has an Aether boiler, I don't see how it will be of any good to us." When Hanna spoke, Arona's expression shifted. The change was so subtle that Hanna barely noticed at first. Then she saw it. Arona's hazel eyes were glimmering with a pale green light. Fog. Without a word, Arona turned stiffly and mounted the stairs. Hanna watched her go, her brow creased in worry. She turned her gaze to the poster which was pinned on the wall of the basement. On the poster was an image of a man in a red cloak. "Oh, Scarlet Man. Please save her." After a moment, Hanna decided to follow Arona. Ariella had finally grown used to the sounds in the darkness, and had checked in the barrels to convince herself that no one was there. She had also worked up the courage to head into the dark passageway, holding her hands out before her to keep from stumbling into anything. After about ten yards, the hall opened into a room with greenish lights along the walls. They were barely bright enough to illuminate the two ramps which led down to another section of the room. Amid the clutter, she spotted a few crates, some sort of broken generator, and a table. The far wall of the room wasn't a wall at all, but lined with several ports in an automaton transport system. Two more hallways branched off the room in opposite directions. With cautious steps, she inched down the ramp. The piles of junk on the table cast eerie shadows against the walls. There were cogs, pipes, glass shards, science papers, vials of acid, and even a rusted automaton chassis with broken optics. Ariella glanced through the open wall and over a deep, snowy crevasse. The storm had not affected this area, so she assumed it was enclosed under the ground somehow. She wouldn't get out of the labs that way. Her gaze drifted back to the nearest of the two adjoining hallways. What could it hurt to keep going? Then the floor creaked, and she jumped. Had that shadow moved? No. Just her imagination. It had to be. Shivering, she crept into the hall, stopping only once to check the contents of a crate. She found a few cans of Spam and some packages of dried fruit. She might be able to eat that, but the Spam was as hard as a rock. Maybe she could use it as a weapon. The path turned twice, then split. One hallway went straight and the other went right. She decided to go right, following the dimly lighted path into a room that was bigger than the others. In the center was a row of broken machines. Metal stands huddled against the walls, hung with more old automaton chassis. In the far wall was a door. The light above it illuminated the area with a reddish glow. A small screen next to the doorway read: Restricted area! ACCESS DENIED. Beside the screen was a slot where a card could be inserted to gain entrance. Where could it be? Somewhere between the entrance and here, certainly. Ariella wasn't so sure she wanted to find the card. The clanking sounds were much closer now, and if she wasn't mistaken, they were footsteps. Automaton footsteps. There was the possibility that she could sneak past them...but if not? Assuming the automatons were Imperial, they would capture her. She would have escaped the Academy for nothing. But then, if Victoria guessed she was here, her best course of action was to go farther away from the entrance. That could mean getting trapped with no escape. For now, Ariella decided that she would wait near the entrance and check outside to see if the storm had stopped. She needed a way to receive Arona's Auto-birds. Ariella made her way to the beginning of the labs, climbed the ladder, and pushed on the trapdoor. It didn't budge. With a surge of alarm, she shoved harder, to no avail. "No," she muttered, her heart pounding in her ears. "No!" She pushed one last time, but only bruised her shoulder. The snow left behind by the storm had trapped her down here. She couldn't leave until it melted. Numbly, Ariella climbed down and took a few steps backward, rubbing her aching head. She bumped into the crafting anvil and turned sharply, gazing at the cold light of the lamp. Taking a deep, shuddering breath, she sat down on a crate and tried not to panic. The cold air stung her throat and made her eyes water. With nothing else to do, Ariella picked up her crafting book and began writing. I'm stuck down here. Stuck like a rusty automaton. How I got here is a long story. Let's just say Victoria lured me into the Snowmoors to get rid of me with her Automayeti monster, and I managed to escape. Going through a trapdoor and into a dark, possibly dangerous hole was a good way to escape a storm and not freeze to death, but now the door is buried under a pile of snow and I can't open it. I just hope it will melt before my rations run out. Maybe I could find more deeper in the labs, but I have no doubt that there's some sort of automaton in here, too. I have no weapons, a week's supply of food (that's even stretching it), and am completely alone. I don't really see how this situation could be any worse, unless, of course, I were to get frostbite, the lamp were to die, or an automaton were to somehow find me. I guess I'll continue considering what other predicaments and ghastly ends I might meet while trapped in this icy prison.